$80 - $100 Flower Bouquets For every occasion there is a perfect flower bouquet that can compliment or celebrate the occasion. A birthday flower bouquet can be made up of the particular flower for the month, or it can be a bouquet of that person's favorite color, or even a selection of bright dazzling colors to compliment the occasion. For all the significant anniversaries, a special anniversary flower bouquet exists with a special type of flower to mark the occasion. For example on the 15th wedding anniversary a rose flower bouquet is the symbol. If you are not sure what bouquet you are after, a tropical flower bouquet is always an exotic option. Fresh Cut Flower Care Tips: Following some basic care tips can help to keep your flower bouquet fresher, longer! Prepare to condition your fresh flower bouquet – Immediately remove you fresh flowers from the box. An recut the stems one inch under running water. Strip the foliage that foliage below the container waterline, to prevent bacteria build up y-that will reduce the vase life of you fresh cut flowers. Place your fresh flower bouquet in a vase filled with luke warm water, mixed with a packet of floral food. 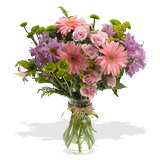 Maintain your fresh flower bouquet - You can cut and rearrange your flowers every few days or as you so wish. Re-cutting the flower stems and changing the water frequently is more important than using preservatives. Re-cutting stems of you fresh flower bouquet ensures maximum water absorption, luke warm water is better absorbed by the flower stems than cold water. The Flower Food will also aid in further increasing and maintaining the freshness of you flower bouquet.